The palace was built as the Town Hall of the City of Amsterdam and was opened as such on 29 July 1655 by Cornelis de Graeff, the mayor of Amsterdam. 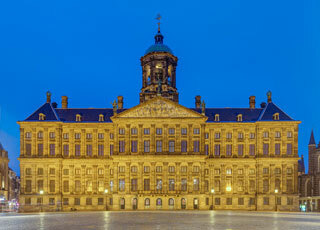 It was built by Jacob van Campen, who took control of the construction project in 1648. It was built on 13,659 wooden piles and cost 8.5 million gulden. A yellowish sandstone from Bentheim in Germany was used for the entire building. The stone has darkened considerably in the course of time. Marble was the chosen material for the interior. This article uses material from the Wikipedia article "Royal Palace of Amsterdam", which is released under the Creative Commons Attribution-Share-Alike 3.0 License.